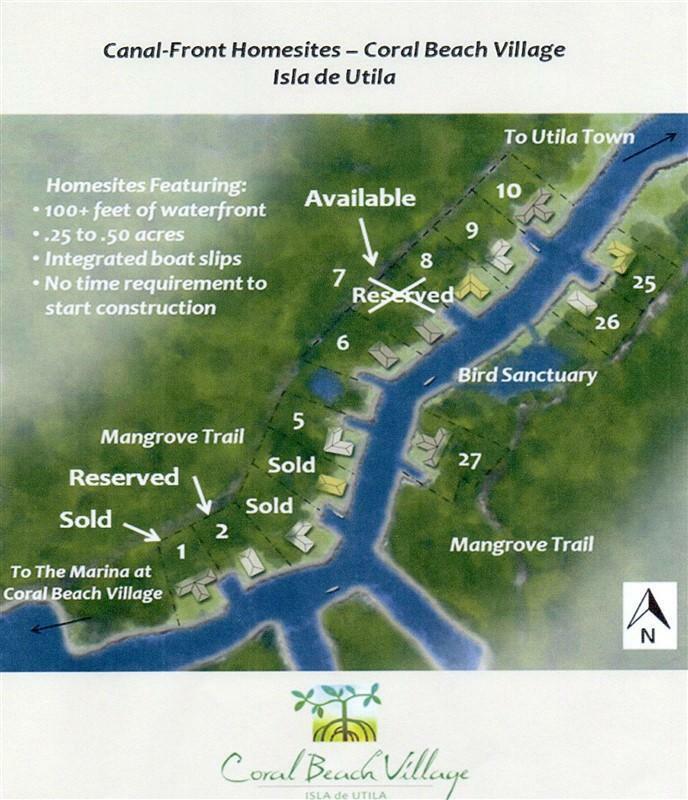 Coral Beach Village is a unique development opportunity located on the South Shore of Utila. 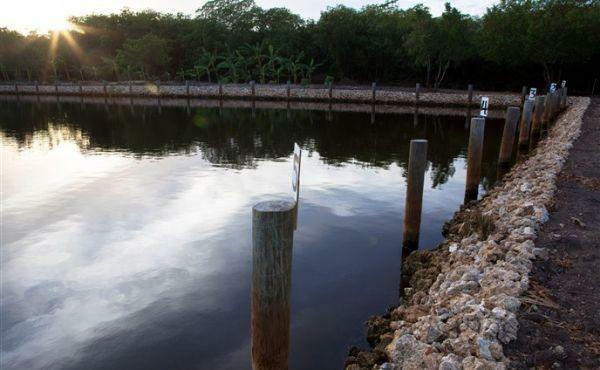 With nearly 300 acres of land that includes staked and prepared home sites, canal home sites, a marina, a popular restaurant and beach bar, 4 high-end rental beach bungalows and more. 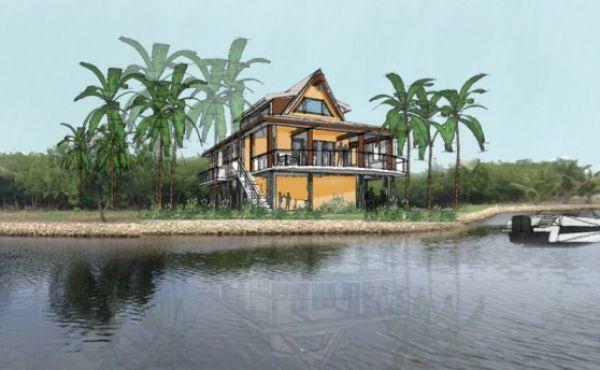 This development has been taking shape over the last few years and is ready to be transferred to a new visionary who can complete and improve upon what has already begun, taking Coral Beach Village to the next level and fulfilling its evident potential. 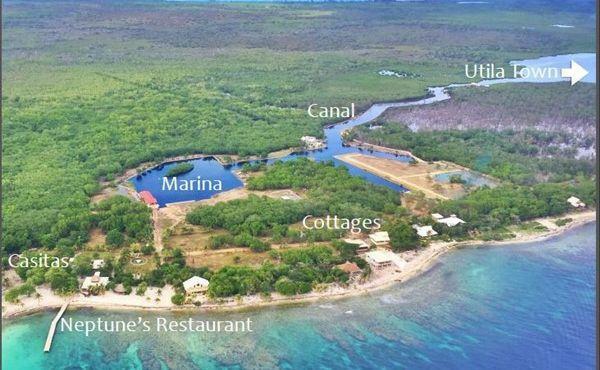 Utila is often likened to the Florida Keys or Cayman Islands of old, and Coral Beach Village offers an incredible opportunity to get in on its development at the early stages of its notoriety, while prices remain low. 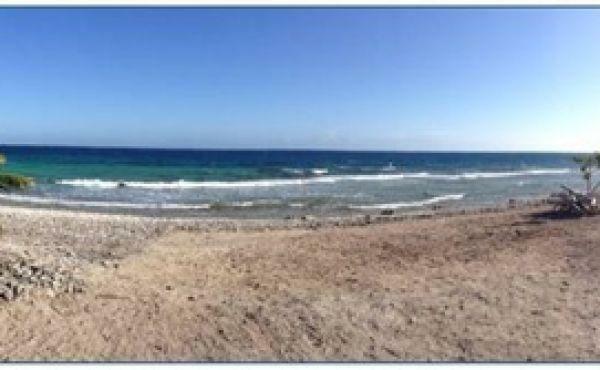 Its superior location in the Caribbean, the beauty of the surrounding natural marine environment, and lack of developments of similar scale give Coral Beach Village a unique competitive advantage. 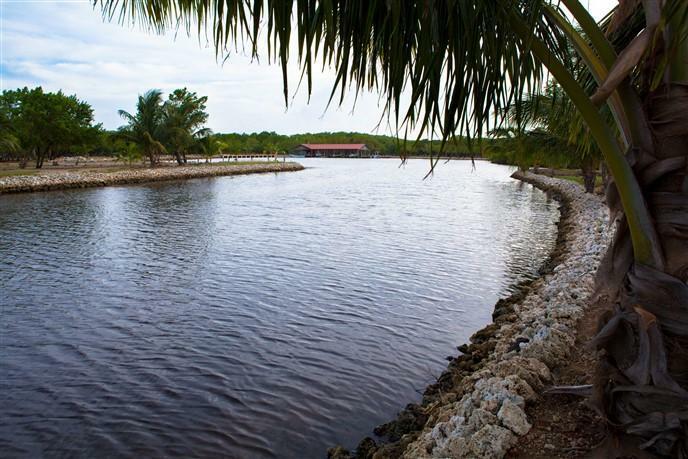 Location: The Oyster Bed Lagoon, located south west of Utila town, connects to the South Shore neighborhoods and provides a protected transportation corridor to Coral Beach Village and points further west. 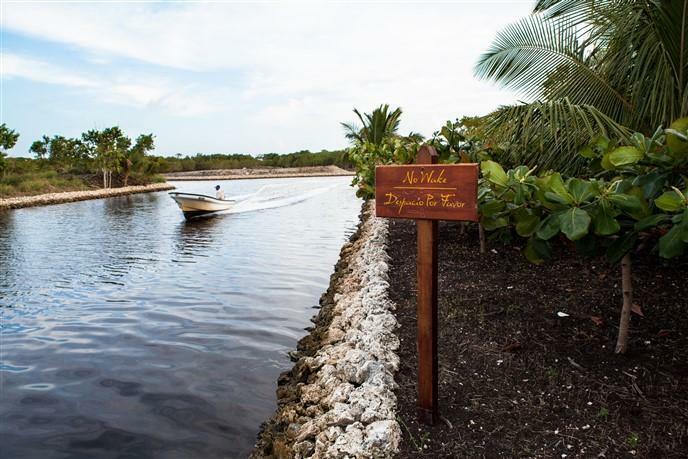 A ten-minute boat through the canal from the western end of town gets you to Coral Beach Village in any weather conditions. 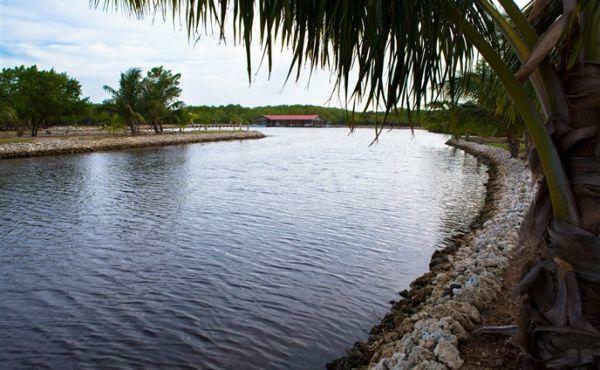 The 60-foot-wide Coral Beach Village canal covers over 1700 feet and is bordered by a coral rock, wake-barrier system. Staked and surveyed home sites are located along both sides of this canal. 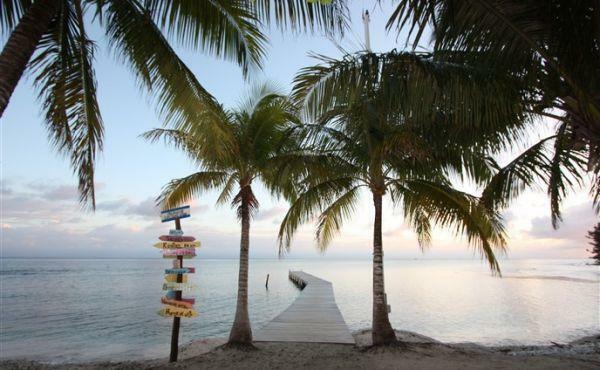 The coastal South Shore of Utila boasts some of the best beaches on the island with distinctive coves, stunning blue water and healthy coral reefs, which offer a multitude of accessible scuba dive sites. Almost any place along the South Shore is perfect to jump in and observe the beautiful marine life just below the surface. One will find turtles and octopus among the creatures of the reef and occasionally, pods of dolphins are seen passing just beyond the drop off. 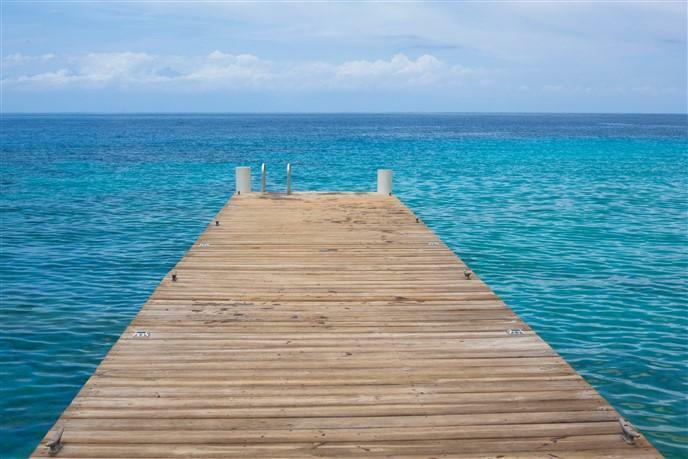 This area is one of the most popular spots among divers and snorkelers. 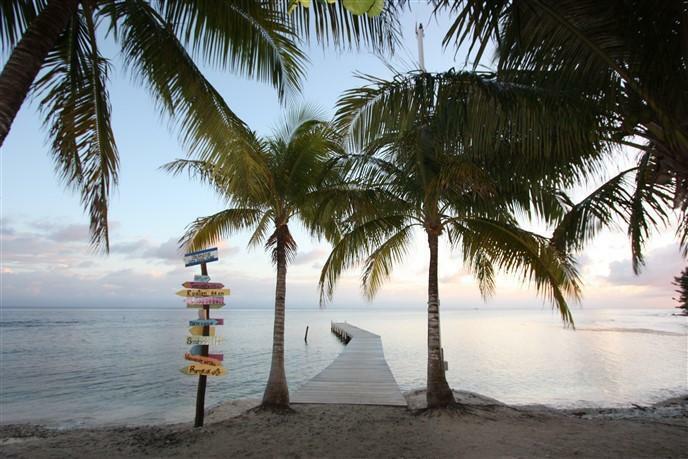 Utila attracts many tourists from around the world every year in order to experience the underwater realm and Coral Beach Village is perfectly situated to accommodate those seeking to explore the marine environment. 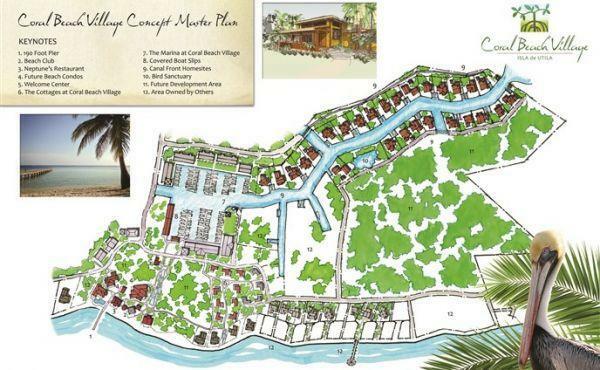 The "heart" of the Coral Beach Village development is currently marked by the Marina basin and a beautiful stretch of beach, known as "Little Bight". 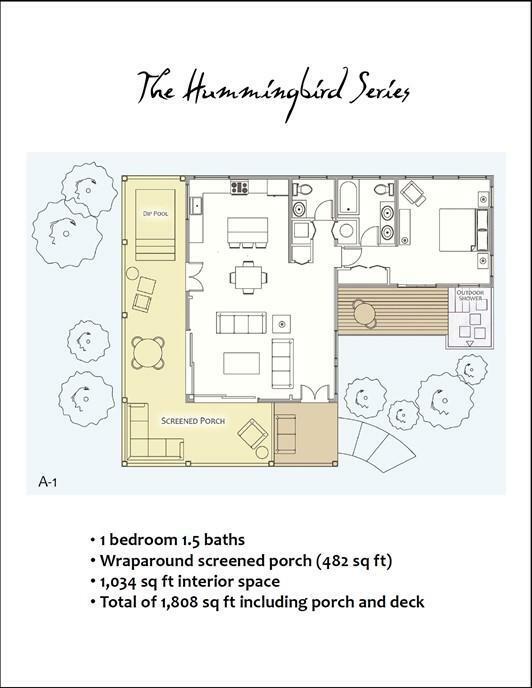 The Marina offers docks and covered slips built with ample room for expansion. 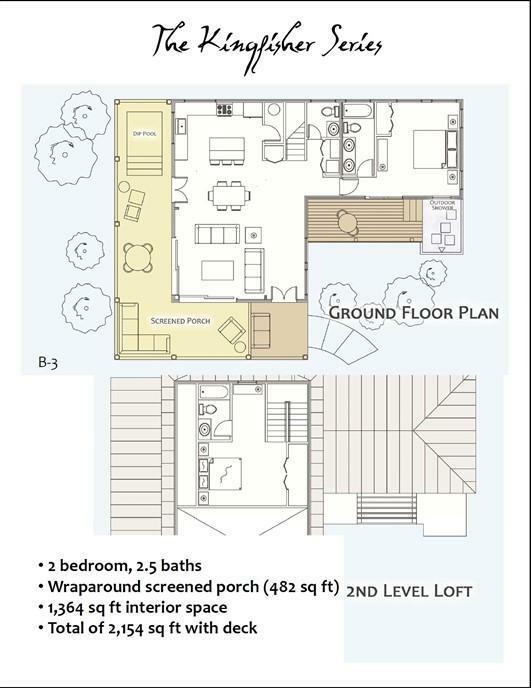 There is also an existing air conditioned space located on the main dock which could be used as an office or small store. 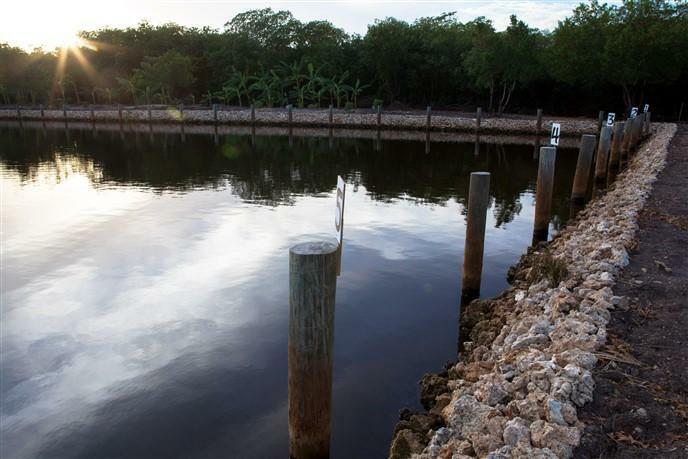 The Marina conveniently connects directly with the public road which passes on an east-west path through the property for access to surrounding areas by bike, golf cart or 4-wheeler. 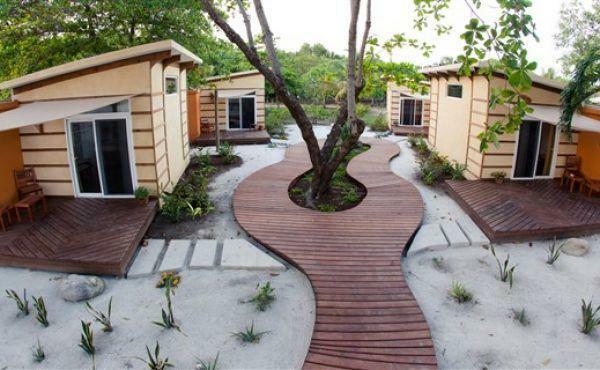 Guests arrive at the resort via the Marina and travel down the concrete paver paseo connecting the Marina and beach. 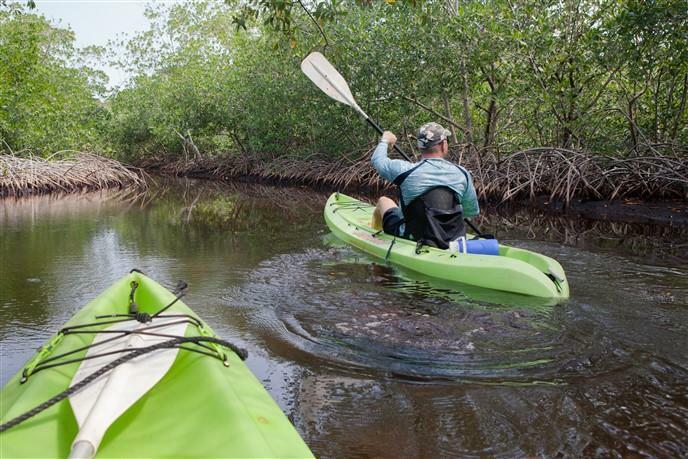 The paseo is thoughtfully landscaped with mangroves, coconut trees and flowering tropical plants. 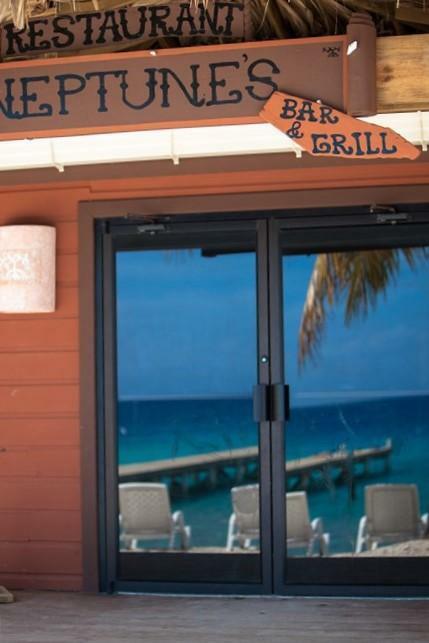 The popular Neptune's Beach Bar and Restaurant is located at the beach in front of a 190 foot pier which gives access to the abundant coral reef and a place for those visiting by boat to moor up to. 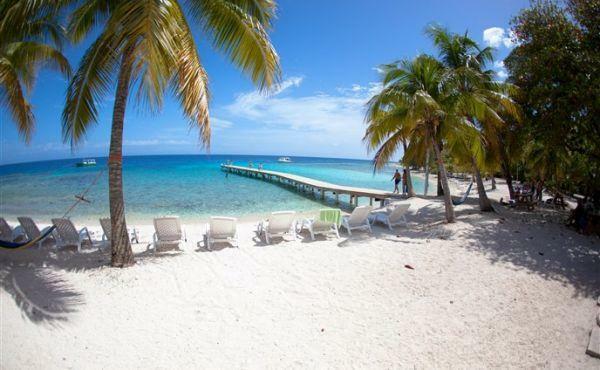 The sandy cove is ideal for swimming, sunbathing, snorkeling, shore dives and other water sports activities. 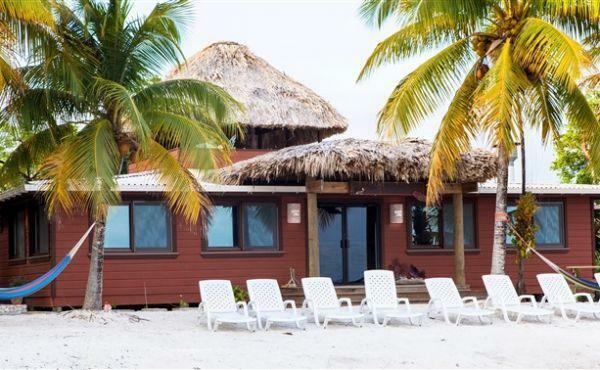 There are shaded lounge areas, hammocks, beach volleyball and a spacious indoor air conditioned dining room. 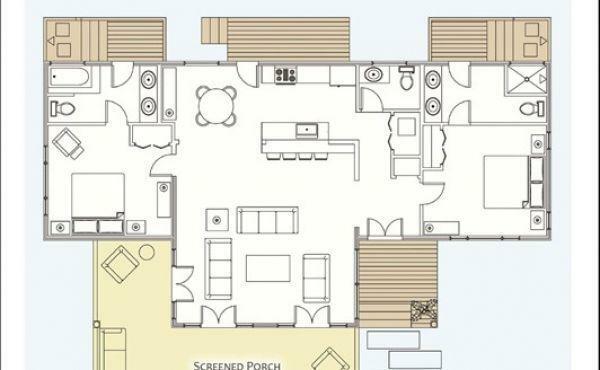 The professional kitchen is fully equipped, designed for efficiency and contains high end appliances. 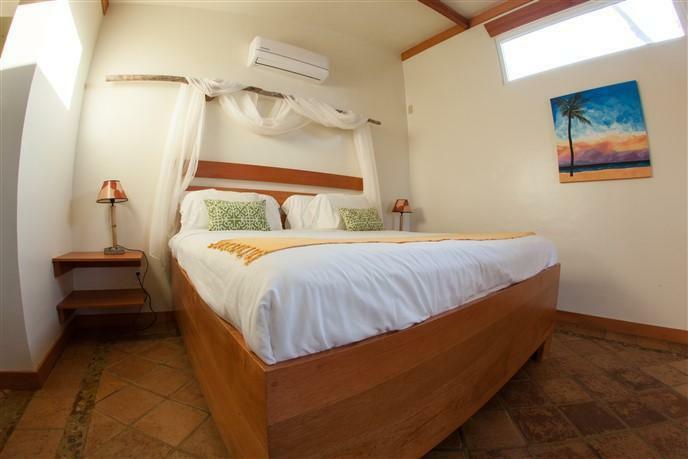 Neptune's has become a popular destination for spending a full day with family and friends for tourists and residents alike. 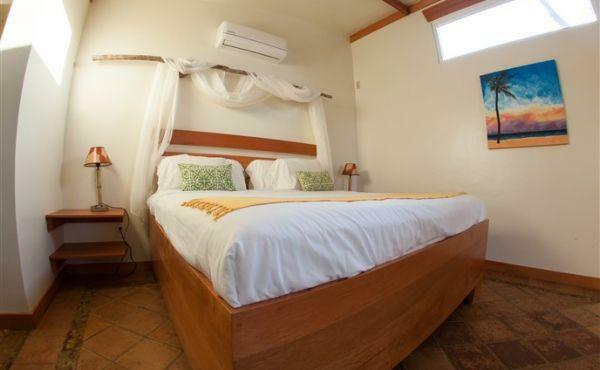 Its unique location with access to the beach and reef, air-conditioned dining area and excellent food and drink have earned Neptune's high standings with review websites such as Trip Advisor. 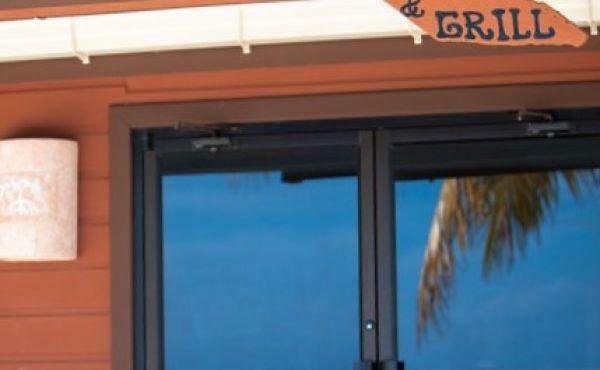 There is a spacious building behind the restaurant, currently utilized as a gift shop and concierge center. 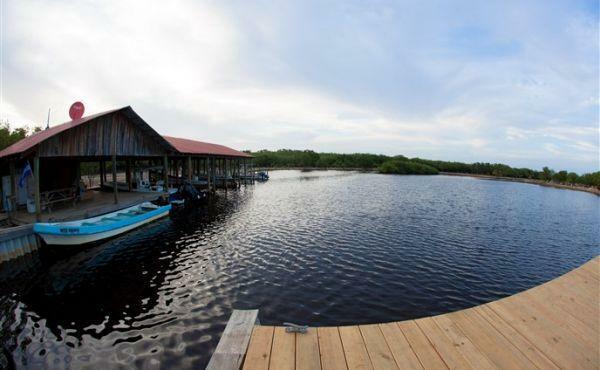 This building also serves as a water sports rental center and could be easily transformed into a scuba dive center. 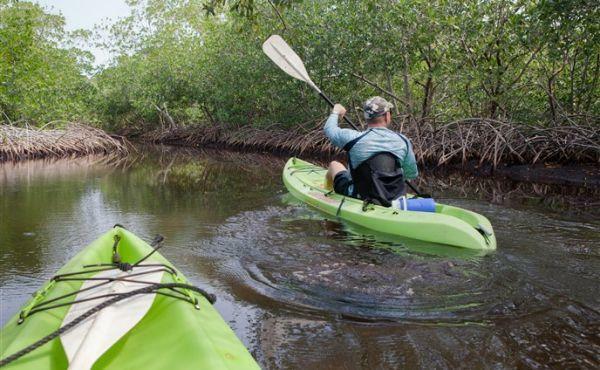 There are stand up paddleboards and sets of snorkel gear for rent. Built into the foundation of the gift shop is the main water catchment cistern with approximately 40,000 gallons of water storage. 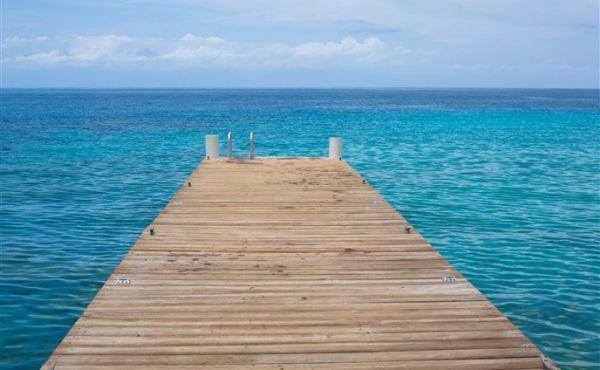 This water is used by the restaurant and the rental bungalows located a few steps from the restaurant and gift shop. 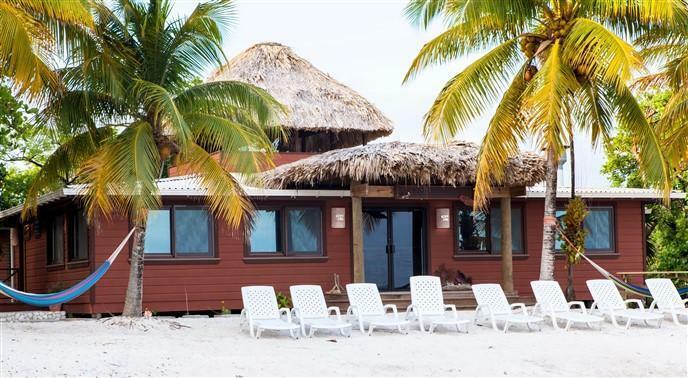 There are 4 beachfront bungalows with hotel room amenities. 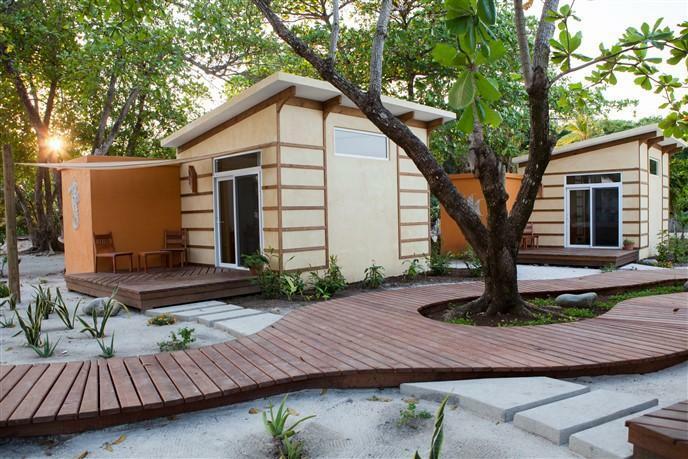 Each bungalow features a private patio, King-sized bed, luxurious bathroom with indoor/outdoor shower, locally made hardwood furniture, air conditioning and a mini bar. 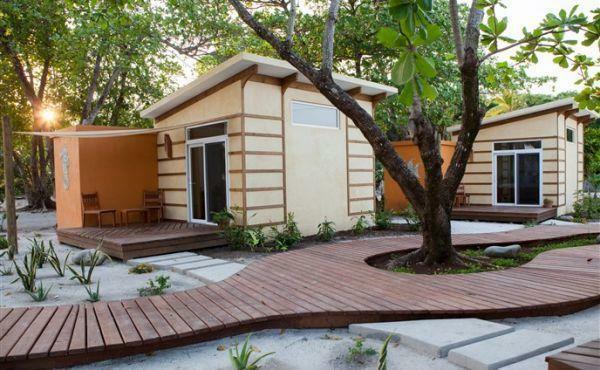 These bungalows showcase a design concept, which incorporates the use of local materials. 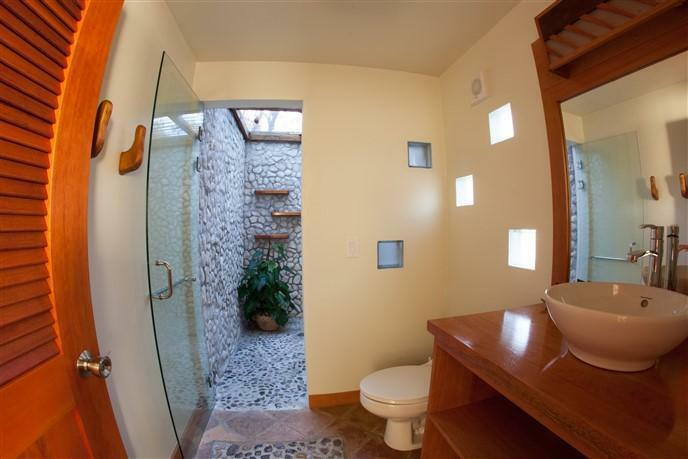 Unique features such as mosaics and rock inlay capture the essence of the design theme. 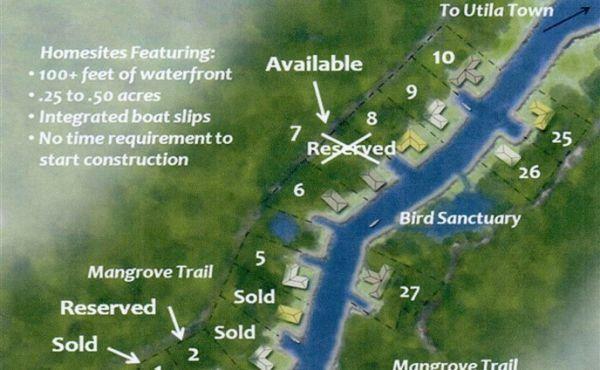 There are 27 signature home sites which line the northern and southern edges of the canal. 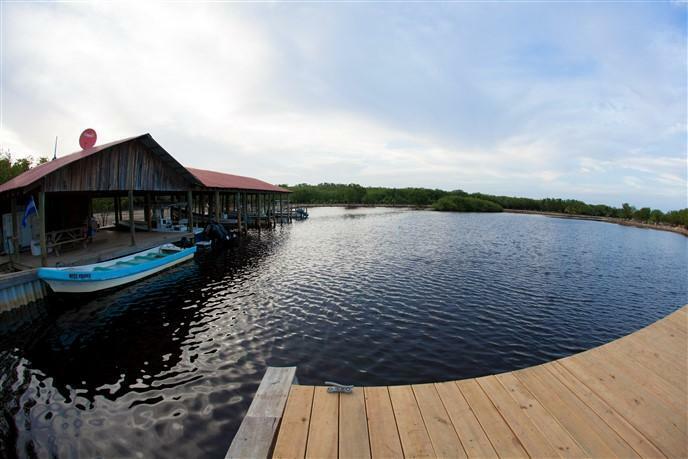 Each canal lot offers at least 100 feet of water frontage including a 20x40 foot boat slip. 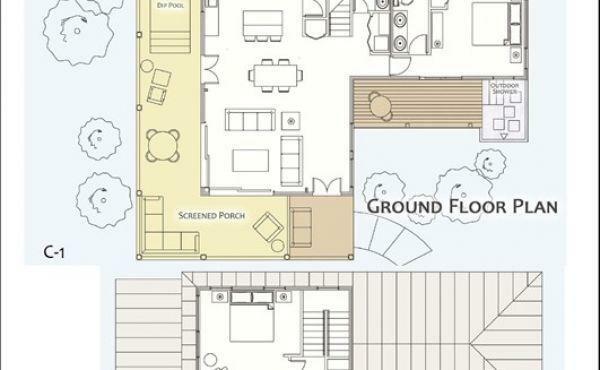 When lot owners decide to build, these parcels are currently subject to sensible design guidelines that are intended to preserve the value and aesthetics of the neighborhood. The prime open land between the marina and beach is prepared real estate ready for implementation of future development plans. 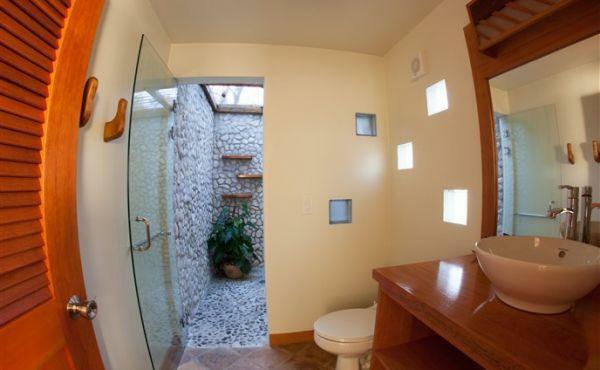 A state-of-the-art and environmentally friendly septic plant handles the waste produced from Neptune's and the Bungalows which can then be released as grey water suitable for irrigation. A CAT 305 excavator handles a number of jobs around the property and a quick change from the bucket to the vibratory arm turns it into a pile-driver capable of putting a 10" post to bedrock in a matter of seconds. 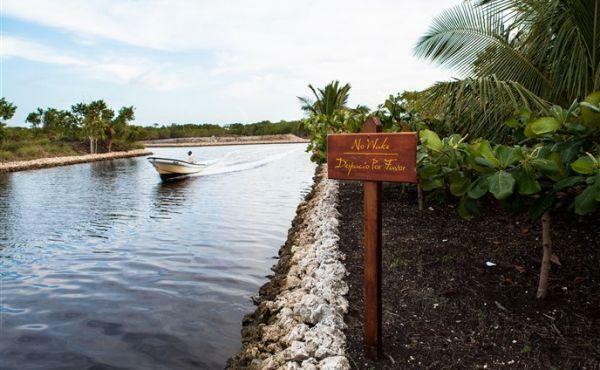 There is a small fleet of boats and vehicles for moving guests, employees and cargo around the development and to and from Utila town. South East of the marina is the Industrial area, where materials and vehicles are stored. This area is home to the block factory where the pavers are made as well as CMUs for building projects. 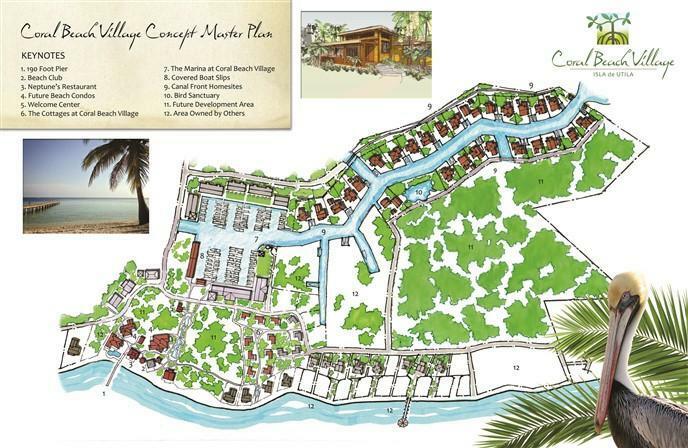 Coral Beach Village has created are a variety of real estate offerings to accommodate a range of lifestyles and budgets. 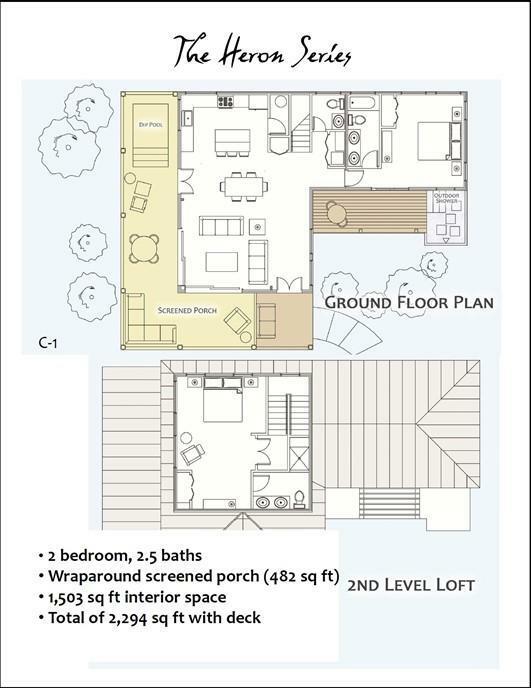 Along with some larger scale concept plans that incorporate the different features encompassing the entire property, there are models and plans for a beach neighborhood within a few feet from the marina and Neptune's with a variety of tastefully designed 1-3 bedroom cottage models with ocean views and shared beach access. 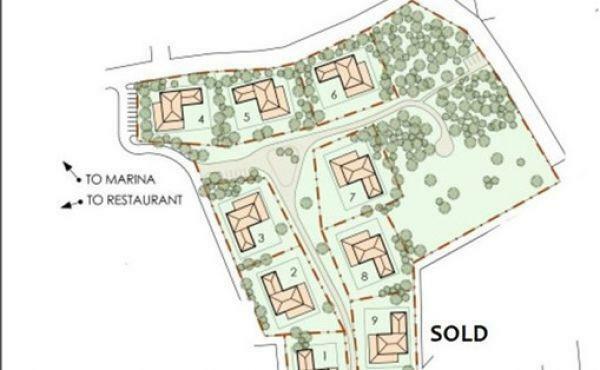 Another of the conceptual neighborhoods is the Villas. 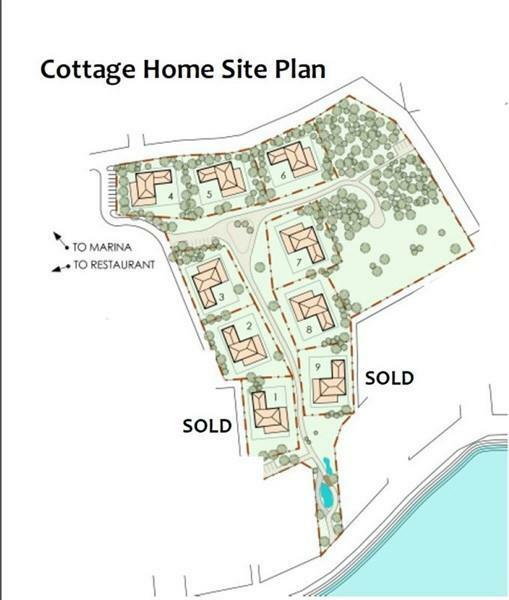 With plans to be located between Neptune's and the Marina, The villas were designed to meet a specific size and price point model for the Utila market. 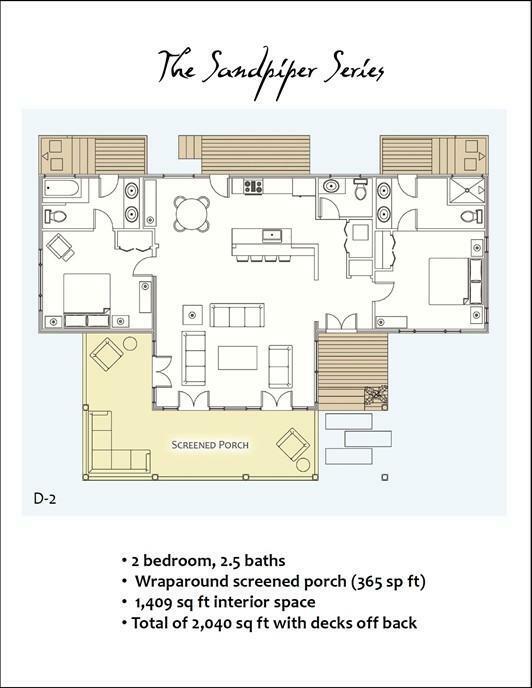 The 2 bedroom/2 bathroom floorplans could house full-time residents, or be used as a seasonal vacation home and included as part of resort's offerings when unoccupied by their owners. The area surrounding the Marina was envisioned as the commercial core of the project. 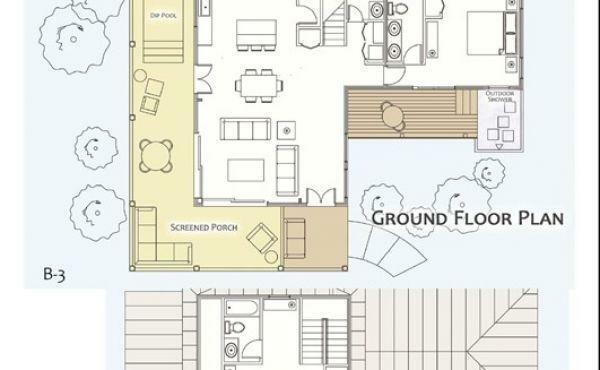 Future concepts include additional boat slips, dry dock storage, a fueling station, restrooms, laundry facilities and a small grocery and hardware store. 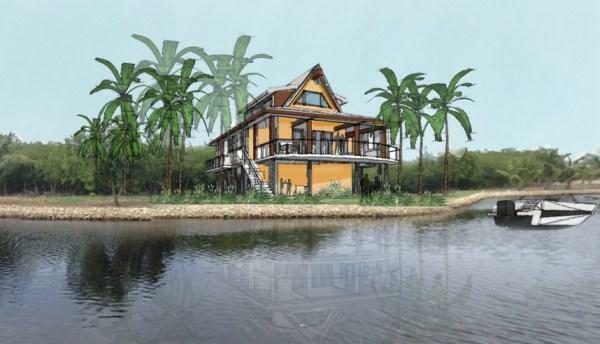 Natural salt water ponds dotted in the mangrove forests surrounding the marina would make for an ideal location for an enclave of overwater bungalows. 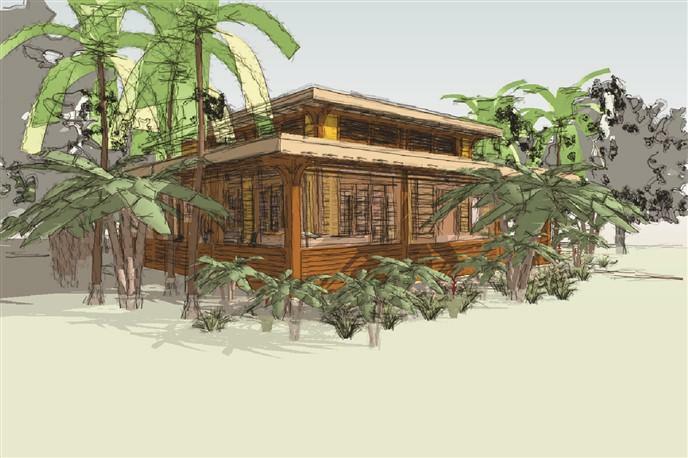 It is possible to envision the concept of an exclusive high end eco-resort in this area. No discussion of future expansion would be complete without bringing up the opportunities at the central beach area. 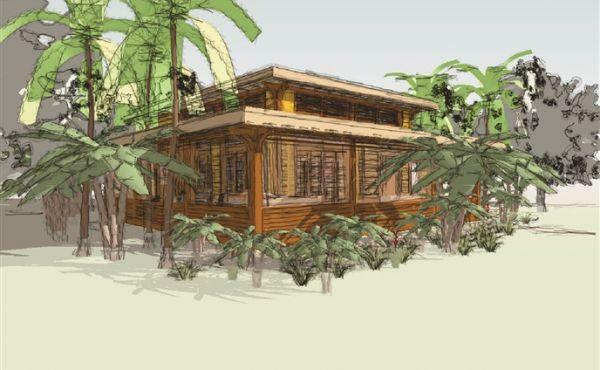 Options could include expansion of the beach bungalows, a condominium program or high end hotel. 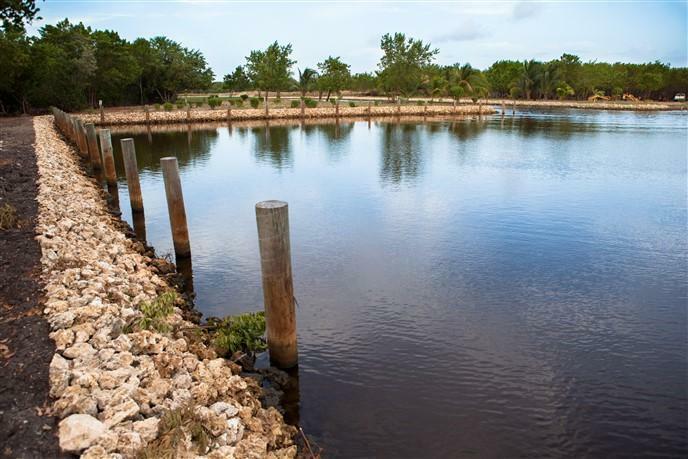 Opportunities also exist for an expansion to the canal system and along with it additional canal front lots. The project has a lifetime development permit issued by the government of Honduras in place and could allow for expansion and growth of the development without concerns of major red tape. 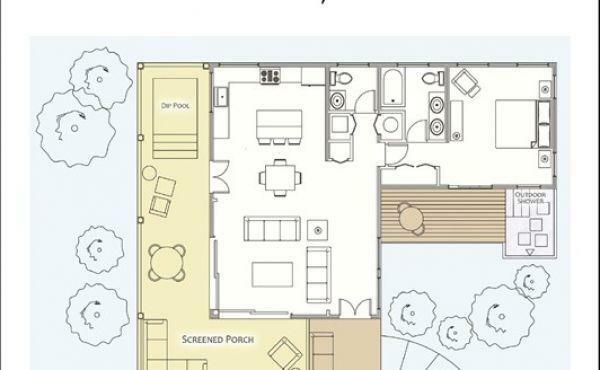 As the South Shore community continues to grow, Coral Beach Village is strategically situated to take advantage of the growing population on either side of the development. 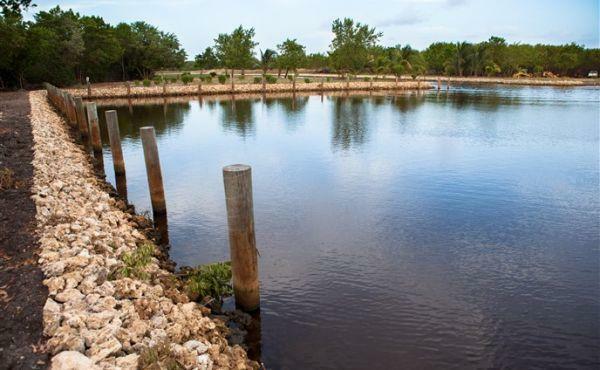 By becoming the main supplier of property management and related services such as housekeeping, landscaping and garbage collection along with future plans for fuel and grocery supply outlets the project could cement itself as the hub for the south western side of Utila. 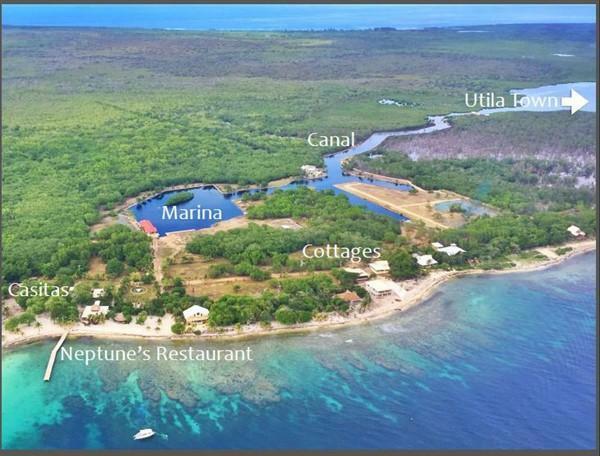 This opportunity in Utila is perfect for those who want to get into residential and tourism development in the Caribbean.